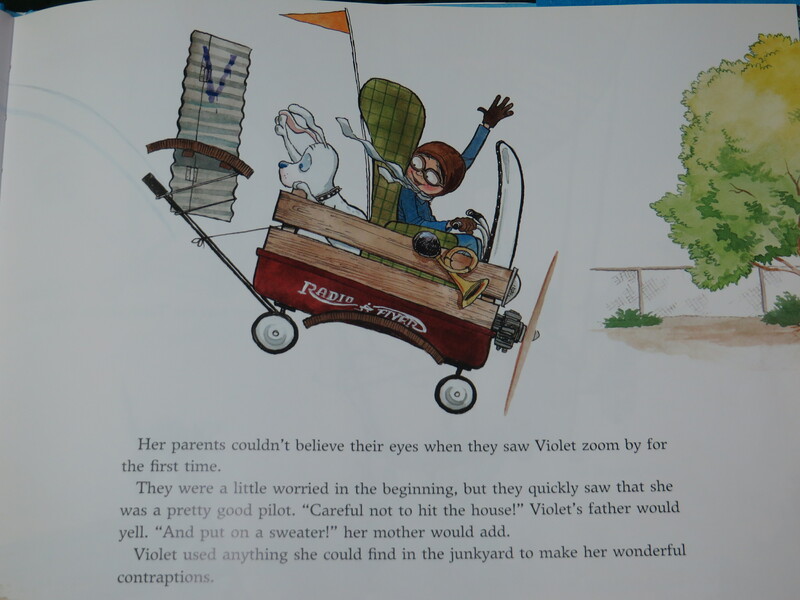 Violet is “a mechanical genius” with a particular gift for building flying machines, a faithful canine sidekick, and supportive parents. What is not to love about book starring a strong, independent, STEM-focused female protagonist whose skills and moxie lead her to save the day? Well… First, the book presents Violet’s inclinations as way outside the norm for a girl: “while other girls were playing with dolls and tea sets, Violet played with monkey wrenches and needle-nose pliers.” Although this book was just published six years ago, this feels outdated. Second, Violet is an outcast. She eats lunch alone; other kids make fun of her; and she hopes to compete in an airshow because, if she wins a prize, “maybe then the kids at school would be nice to her.” While she ultimately saves the lives of an entire Boy Scout troop, and gains the respect of her community, there is real pain here that the wish fulfillment doesn’t hide. But the boys love this book and focus on Violet’s brilliant designs, her dog, and the happy ending. (We do talk a bit about how the other kids at school are being unkind and missing out by not getting to know her.) This is the first book on this blog that we discovered through my oldest bringing home books from his school’s library, but I’m guessing it won’t be the last. This entry was posted in Picture Books and tagged Animals, Machines, school, science, Steve Breen, Violet the Pilot. Bookmark the permalink.